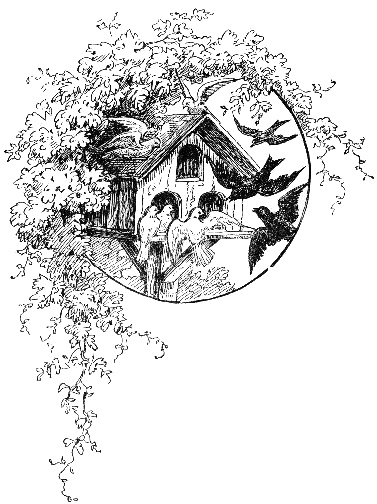 Vintage black and white bird house illustration. It’s from an 1885 book, so it’s fairly safe to say that it’s in the public domain. This is only the 5th bird house drawing that I’ve shared with you on Reusable Art it is an interesting one. It was used to accompany an old story about an innkeeper who had to make the decision whether or not to open his public house to the coarse people of the forest or the peaceful farmers. It is a bit of a story of good and evil. The bird house, like that inn, is open to the public. It’s clear there’s white birds (maybe doves) and black birds wishing to claim it as their own. Perhaps they will live happily in each half of the birdhouse, perhaps they will fight over it. Ironically, when animals fight over stuff in our yard, it is often some clever little creature who steals the prize out from under the combatants. Of course, you could simply use this black and white bird house drawing without mention of metaphors and good and evil and just enjoy it.